Hedge funds over the last 3 days have been in relentless pursuit of Britain's biggest mortgage bank, Halifax Bank of Scotland (HBOS) as the next bank to be pushed over the credit crisis and housing bear market cliff, amidst an atmosphere of global defaults in the wake of Lehman's collapse on Sunday. In emergency action both sanctioned and sponsored by the Bank of England saw Lloyds TSB step in to buy the Bank before the Government was forced to step in and rescue the bank much as happened following the Northern Rock bust in September 2007. Only at that time the Bank of England in a huge unforgivable blunder that destroyed much of the central banks credibility, PREVENTED Lloyds TSB from taking over Northern Rock. HBOS Shares had crashed on today's opening to as little as 90p, that's a fall of more than 66% in just 3days! as the Hedge Fund sharks smelled and tasted blood. The Hedge fund speculators first targeted HBOS, back in March of this year following the bailout of Bear Stearns into the arms of JP Morgan, HBOS experienced a similar crash in share prices in the face of hedge fund short selling. At the time this raised statements from regulators warning speculators against such action. The Bank of England and the FSA took the unprecedented step of issuing statements that categorically denied the rumours. The FSA went further that it had launched an investigation into the trading activity surrounding HBOS and other banks this morning and accused traders of 'market abuse by spreading false rumours to profit from short-selling. 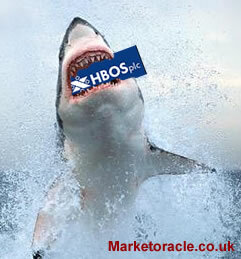 The assault on HBOS forced the company to release the statement on Monday, "HBOS is a strong financial institution. The group's capital ratio - a core measure of financial strength - is the strongest of the major UK banks." The article Hedge Funds Target Halifax, HBOS as Shares Crash 30% illustrated how hedge funds were specifically targeting HBOS early Monday, a near 24 hours before the mainstream media awoke to the significance of unfolding events. The near collapse of HBOS is a seismic event for the UK financial system and British economy as virtually 1 in 3 adult Brit's are HBOS customers which brings home the credit crisis right into their every day lives like no other event so far has. The bid by TSB (mistakenly referred to in the media as a merger) prevents a complete meltdown that would have occurred had events continued that would have witnessed a run on the bank, not by small investors but by other banks calling in their loans pf millions of pounds to HBOS, for that would have resulted in the same outcome. The combined bank will be a giant in the British retail sector with more than 22 million customers and controlling approximately 30% of the UK mortgage market. Under normal circumstances the authorities would prevent such a merger due to competition concerns, however these have not been normal times since August 2007, when the credit crisis first broke as the interbank money market froze. The bank was worth a mere £6 billion during today's morning which is a far cry from the £70 billion barely a year ago. Lloyds TSB itself has suffered a substantial loss of value which now puts the combined banks value at £30 billion. The biggest immediate losers are the shareholders with the expectation that Lloyds TSB will pay a rock bottom price for the bank which last traded at just £1.40 a share. How many could have imagined a year ago that the Halifax would be brought to its knees, literally hours away from being tipped over the edge into nationalisation, the answer is NO ONE!. 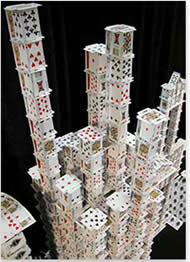 Today's HBOS near collapse is but just another card in the crumbling house of financial cards as we are literally witnessing a global financial meltdown as capital devastated banks now teeter and one by one get pushed over the edge of the credit crisis cliff. As each bank fails it sends out a ripple of defaults across the global financial system. Like a chain reaction in a nuclear reactor in meltdown. Lehman's collapse, closely followed by the nationalisation of the worlds biggest insurance company AIG, does appear to be literally exploding right before as the financial markets are now clearly in the grip of systemic distrust, where financial institutions are unwilling to transact business with one another for fear of counter party default. This implies a flight to safety to traditional safe havens such as gold and the other precious metals as well as short-end Treasury bonds. Stock holders the world over are wondering which way will their capital be destroyed ? Will it be through bankruptcy or through nationalisation? In such a climate all stocks get dumped, after all if the likes of Lehman, AIG and now HBOS can be toppled then there literally is no safe stock to hold!, hence shares are again today being dumped as elaborated on in the analysis of 9th September - BANKRUPT Banks Wiped Out by Tulip Backed Securities. This may prove to be the straw that broke the camels back, and the UK government may follow the United States earlier decision to highly regulate short selling in key financial stocks. The aim of which is not to prevent long-term trends, but to give a company breathing space to investigate options such as a takeover or re-financing which is much more difficult to do in the face of relentless short selling. Whether the government takes action on this depends on how much profits the hedge funds have made on the HBOS collapse which will become apparent in the coming months. As mentioned earlier, the Treasury and FSA had voiced concerns in March when HBOS was first targeted, but to date nothing has emerged with regards short-selling regulation. My view - Under the current credit crisis circumstances, the UK government should follow the US example as it will have the effect of decreasing pressure on distressed banks, giving the banks officers valuable days if not weeks for a better more favorable outcome, than shot gun weddings amidst blind panic meltdowns. Currently UK savings are secured at £35,000 at 100%, this is proposed to rise by the end of this year to the first £50,000 at 100%. However as the Northern Rock example illustrated that the Government was prepared to step in and guarantee ALL savings at 100%, and therefore giving an unequivocal guarantee to savers so as to bring the Northern Rock bank run to a halt. Similarly should other retail banks such as HBOS fall over the edge of the credit crisis cliff, then similarly the expectations are for 100% security for all savers. However savers should take note of the difference between a high street retail bank such as HBOS and an Investment bank such as Lehman Brothers, therefore ensure that they definitely do limit exposure to non retail banks to £35,000. Whilst the bank has not been nationalised, however the outcome will be similar in that Lloyds TSB will be looking to reduce its exposure to the UK housing market so as to concentrate on the core profitable arms of the bank. Therefore the expectations are for HBOS mortgage interest rates to rise significantly as the bank seeks to push mortgage holders to remortgage into the arms of other mortgage banks and therefore reduce its risks of default further down the line as the UK housing bear market enters its second year. HBOS staff should be under no illusion, this is NOT a merger it is a TAKEOVER of a greatly weakened bank by Lloyds TSB. Therefore HBOS jobs are at serious and near imminent risk as the HBOS mortgage book contracts so will the need for the vast branch network, therefore the expectations are for huge job losses amongst the banks 72,000 workforce which is more than 12 times that of Northern Rocks original workforce of 6,000 that has subsequently shrunk to less than 4,000 or a loss of over 33%. In actual fact the expectations are that over the next 12 months the HBOS workforce will fall by a much larger degree, probably in the region of 50%. HBOS is the corner stone of the UK housing market, for the bank to be under such distress is a clear sign that the UK housing market crash of Summer 2008 is set to continue for the rest of the year. My existing trend forecast for a fall of 15% over 2 years as of August 2007 has been exceeded by a significant degree as a consequence of which an update is now pending to cover the UK housing market trend for the next 2 years in the face of global deleveraging of asset prices as bankrupt banks are forced to liquidate assets and the deep ensuing economic recession. Our friends at Elliott Wave International have made available their 5 page report to our readership The Most Important Investment Report You'll Read in 2008. which covers the credit crisis and stocks bear market. Your analyst witnessing history in the making. Nadeem Walayat has over 20 years experience of trading, analysing and forecasting the financial markets, including one of few who both anticipated and Beat the 1987 Crash. For more in depth analysis on the financial markets make sure to visit the Market Oracle on a regular basis.